This membership is open to all students currently enrolled in any recognized university or college and are taking any accountancy course. This also refers to those students who are currently taking up the CAT® Program. 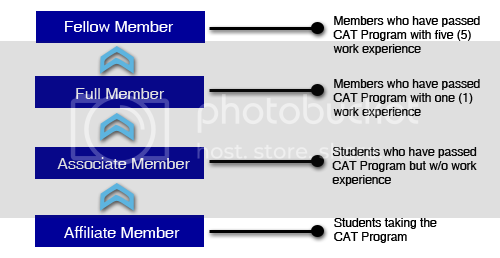 This membership is open to those students who have passed the CAT® Program but have not yet completed at least one (1) year of relevant work experience credited by NIAT. This membership is open to those members who have already passed the CAT® Program, accomplished at least one (1) year relevant work experience in any accounting or finance environment that has been credited by NIAT. These members are given the honor to use the CAT title after their name. This membership is granted to the most experienced members who have been Full Members of NIAT and have at least five (5) years of relevant work experience in any accounting or finance environment that has been credited by NIAT.